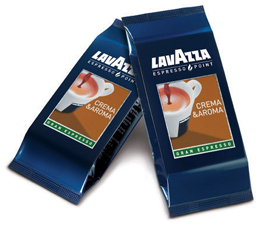 Lavazza Aroma Point Crema is a blend of coffee from Brazil, Central America, and Africa, creating a perfect balance of velvety crema and an intoxicating aroma. This espresso blend is available in simple, single-serve cartridges for exclusive use with the Lavazza Espresso Point Machine. Everyday use is as easy as placing a cartridge in the machine, pressing a button, and delicious gourmet espresso is ready in moments. Lavazza Espresso Dek Decaffeinato is a full-bodied blend that doesn’t sacrifice flavor to remove caffeine. Made using a natural-water process, this high quality espresso is available in single-serve cartridges for use with the Lavazza Espresso Point Machine. Everyday use is as easy as placing a cartridge in the machine, pressing a button, and delicious gourmet espresso is ready in moments. Lavazza Espresso Dek Decaffeinato cartridges come in cases of 50.